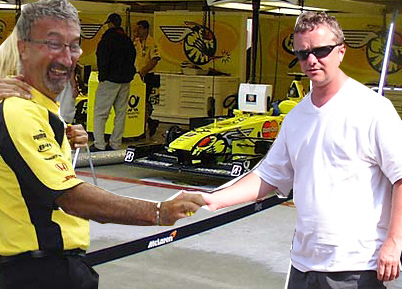 C Beezenruun has finally sold the club to none other than flamboyant ex Formula One team boss Eddie Jordan. I asked Eddie what made him invest in The Hornets. Could this be the re-birth of the Hornets, now to be known as the Buzzin’ Hornets. In private, JB was expecting the worst. When the reality was that nothing less than a win could guarantee Premiership status, to be facing the Champions in your final match was a little daunting. His fear were compounded when they went down after only 4 minutes to a sloppy piece of defending which put Aaron Whalley through for the opening goal. The need to push forward then left further gaps which STA duly exploited, but the Hornets sheer determination saw the wing backs put in a gruelling performance running the length of the pitch time after time. The second half saw the Hornets really step up a gear with wave upon wave of attack eventually rewarded on 83 minutes with Geoff Kibble’s precision lob over keeper James Walker to give the point to the home side. Calvin Staunton was rewarded with yet another Xpert Eleven captaincy on his final game and it was a nice touch that todays STA reserve goalie – the legendary Warren Trigg was there to present the trophy to an emotional Staunton, who was consoled by celebrity chef Gordon Ramsey – although no one knows what he was doing there. JB’s side were clearly out for a draw this afternoon as they took on Henry’s Hustlers at the Leeroy Jenkins Stadium. Packing the goalmouth with their own players, it was difficult to see how this was going to develop into ant sort of football match. However, it was Highcroft who had the first attempt on goal, with Wilf Spedding in his debut appearance for the club breaking out of his own six yard box with a fine 10 yard run before launching a thundering drive at the Hustlers goal. Unfortunately it didn’t quite make the halfway line. The referee, sensing that the crowd were rather unhappy at seeing no football, chose this moment to show young Daley Fisher a straight red card for swinging off the crossbar while Darren Billing fetched the ball back, much to the delight of the crowd. This however, served merely to tighten the Hornets resolve and they quickly regrouped on the goal line for the rest of the game. Clearly, referee Tage Duvage now had a problem. In order to pick up his paycheck from the Hustlers, he needed to find a way to get the Hornets off the goal line. On 65 minutes The Hustlers Martin Litu slipped his hand up Joan Valcarce’s top, copping a feel and earning him a yellow card for sexual harassment. Not adverse to controversy with the Hornets, as seen in their recent game with Oxenhope (see report) , the ref then took the opportunity and awarded the Hustlers a controversial penalty. 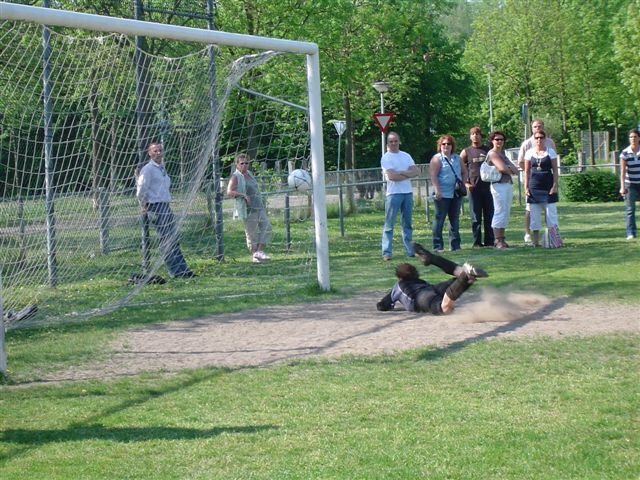 With only the injured Klijnhout to beat, Todd Cole coolly slipped the ball neatly into the bottom right corner, giving the keeper no chance, and the Hornets a similar chance of staying in the Premiership. 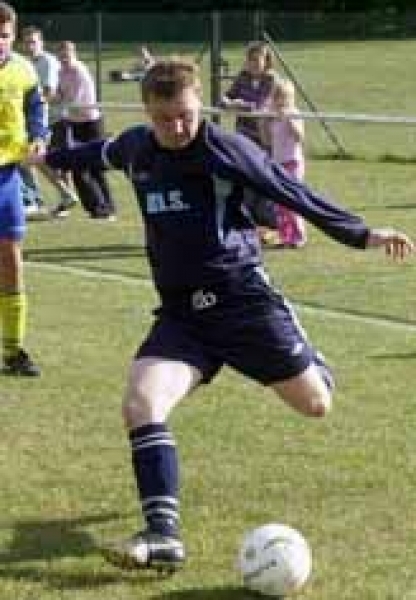 Kingpin defender Calvin Staunton has decided to hang up his legs at the end of the season. The veteran of 82 games would have seen himself reach 100 appearances had he decided to continue for one more season, but felt that the time was right to bring his career to a close. “Following the injury during the clash with Wals Reds two seasons ago, I didn’t think I’d ever kick a ball again, but the American doctors did a superb job with the bionic legs, and I was better than ever! 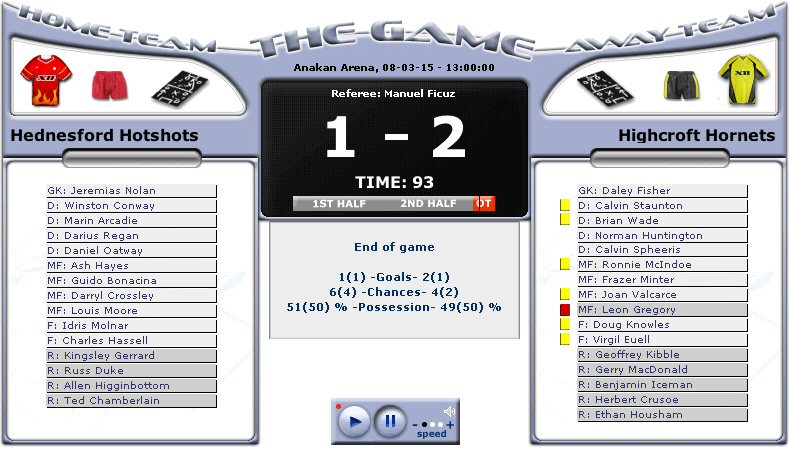 But it’s a tough league and as my last two matches showed, I’m having trouble keeping them attached these days.” He was of referring to his rather harsh sending off – the only red card of his career; and the last game against Newnham Rovers, where the Rovers keeper managed to save his leg from hitting the back of the net. Calvin’s injury troubles began when Mr Wal, well known for his links with the Chinese Triad underworld, and his pathological hatred of the Hornets, was rumoured to have ordered the ‘hit’ on Staunton; a charge he has vehemently denied. The 32 year old will be sorely missed at Highcroft. With a massive 67 Xpert Eleven appearances, he is by far the Most Valuable Player ever to grace the X11 league. His record is even more astonishing when you consider that other M-F League greats STA’s Warren Trigg, Menstrie’s Guy Daltry and the Hustlers Graeme Cunningham have 109, 98 and 97 games respectively to their credit, and yet cannot compete with Staunton’s X11 appearance nor match/X11 ratio. Another unusual statistic is that Calvin heads up the Number 1 hit on Google – Try it! It won’t be the last we hear of Calvin though – he has signed up as a reporter for the Sporting Times and his wisdom on the field will surely be a great asset to the paper. He is also rumoured to be Hollywood bound to star with Michelle Ryan in the new series of the Bionic Woman, but he is keen to point out that it is very early days on that one! It was a weary looking Rovers side that took to the field after a gruelling flight from Rourkes Park, South Africa. However, the hailstones soon perked them up and began a game full of incident for the game which strangely was once a local derby. Rovers Pablo Junior was the first to steer the ball home on 11 minutes after breaking the Hornet’s offside trap, only to see the goal disallowed for offside. Replays showed this decision was spot on from the third official, although Junior can consider himself lucky not to be booked following the ensuing argument – his Latin temperament boiling over at referee Hans Gruber. Just before the half hour mark and the Hornets get a free kick which Calvin Staunton took. Totally miskicking the ball, he again suffered the misfortune of his bionic leg slipping it’s attachments, meaning the ball was merely tapped to Ronnie McIndoe forcing a wonderful leg save from Rovers keeper Barry Gilmore. But the goal of the day came from Al Tate, whose curling free kick into the top left corner was Worthy of anything Beckham could have produced. Stand in keeper Daley Fisher could only stand and watch as he was beaten by the super strike. Straight from the kickoff though, Highcroft equalised when Leon Gregory saw poor Barry Gilmore taking the opportunity to get a quick drink from his water bottle and fired a scorching drive from 35 yards. A bit like Mark Wilson’s when Ulverley played Langley primary in 1976 – one that stays a long time in the memory. Soon after the restart and Pablo Junior was again shouting his mouth off after being judged offside putting Edgar Felix through to score. This time however, he had a point – it was certainly close, with the referee choosing to go with the crowd, who were particularly vocal today. Gerry MacDonald was the first to have a go on goal with a cheeky back heel which bought out a fine reflex save from Gilmore. But it was left to Joan Valcarce to seal the game in the Hornets favour with ten minutes remaining – today wearing tight hot-pants and figure hugging Lycra shirt; latching onto Norman Huntington’s firmly struck cross to the near post. Joan Valcarce celebrate to the home fans by putting shirt over her head, finally confirming her status(Sorry folks, we had to censor it). Regular keeper Roger Klinjhout will have trouble getting his place back with Fisher playing as he is, denying the superb Al Tate with two minutes to go to keep the points staying at the Highcroft Arena. Following JB’s comments about poor quality refereeing, he was not relishing another tie with a 1 skilled referee. He was not disappointed. The first half opened with the Hornets taking kick off. After Geoff Kibble and Ben Iceman had got over their fit of giggles on their plan for the kick off, Geoff eventually ran around the pitch before standing on the goal line for his run up. Being a tad over 30 year of age this took some time. However it was worth the wait. With the clock showing exactly 22 minutes since the whistle Kibble, ran up to the ball, and in true under 7’s league style, toe-poked a shot which whistled past the Oxenhope keeper but just over the United crossbar. Fortunately it hit the irritating United fan with the air horn before bouncing over the stand into Mayswood Road, taking a further 15 minutes to retrieve. No sooner had they done so, Ben Iceman latched on to a poor backpass and cooly netted the opener, only to see it disallowed for offside!!! From a backpass!!! The second half saw Oxenhopes only attempt on goal with a good 30 yard effort from Kittel following Bigalow’s intelligent free kick. On 65 minutes during a surging run into the opposition box, Calvin Staunton’s bionic left leg fell off, clipping United defender Alexander Ciobotea, knocking his Italian loaf straight from under his arm. The referee deemed this dangerous play and issued Staunton with a yellow card. Staunton spent the next 12 minutes hopping after referee Tage Duvhage asking him to stop play so he could re-attach it. When he finally caught up with him however, Duvhage issued Staunton with a red card for arguing. Staunton had the last laugh however, operating his on-leg telemetry from his laptop, he caused Tony Meaker to trip, pushing Ethan Housham over in the box leaving the ref no choice but to award a penalty to the Hornets in the 87thminute. With Staunton off the field however, it was down to rookie stand-in keeper Daley Fisher to guide the ball home from the spot, bizarrely making him joint 2nd place goalscorer in the process – such is the poor quality of the Hornets attack this season. JB was furious once more about the quality of the refereeing. “I’m amazed we got any kind of result out of it” He said. What can you say when you set your team up to play cautious and normal aggression and you end up with 6 yellows and 1 red, compared to your opponents nil? 3 bookings inside the first 15 minutes and 1 sending off 2 minutes into the 2nd half.